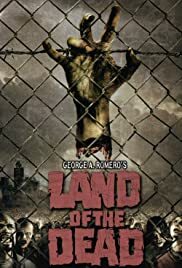 This featurette on the LAND OF THE DEAD DVD takes a look at the work of Greg Nicotero, the man who brings death to countless humans. Asia Argento, Dennis Hopper, John Leguizamo and George Romero give quick comments on the work that Nicotero does and then we hear from the man himself. He talks about growing up watching horror movies and gives the quick story of his connection to DAWN OF THE DEAD and then how he came to work with Romero. He gives us a behind-the-scenes look at several of the zombie effects in the film and shows us a couple of the zombies, how he came up with them and what he wanted to make them do for the film. Fans of the film are certainly going to enjoy watching the behind-the-scenes stuff of the zombies being made up but the main group that will get a kick out of this are those who enjoy making up their own creations or those who want to go into the special effects department. They will enjoy seeing how the zombies were made and hearing about the various types of rubbers used to bring them to life. At just under 10-minutes there's no great detail given but it's quick and fun feature.